Patagonian toothfish (Dissostichus Eleginoides) live predominantly around sub-Antarctic islands like South Georgia. It is a slow-growing, long-lived species. In 2004, the South Georgia toothfish fishery became the world’s first toothfish fishery to be certified as sustainable by the MSC. The fishery was recertified by the MSC without conditions in 2009 and 2014, scoring 96 out of 100 against the three MSC principles, making it one of the world’s highest-scoring fisheries assessed against MSC standards. Other toothfish fisheries in the Southern Ocean have since followed this lead. The Government determines the amount of quota which is available each year based on scientific advice, taking into account GSGSSI’s precautionary management approach. Much science is conducted each year by fishing vessels and science research cruises to support this management approach. Strict quotas – based on scientific research and surveys. Minimum fishing depth of 700 m – to protect juvenile fish. Closed areas – to protect spawning fish and biodiversity on the sea floor. No fishing is permitted within 12 nautical miles of South Georgia. Scientific observers on each vessel – to collect data for stock assessments and report on vessel operations. Restricted season – mid April to 31st August to coincide with the non-breeding season when most of the vulnerable species depart from South Georgia waters. Night-time setting of hooks – to avoid diurnally active birds. Minimum line weighting – to aid hook sink rate. Streamer lines – to scare birds away from baited hooks during line setting. support the long-term precautionary management of the fishery. The Government operates an open application process for licences and competition for licences is always high. All applications are assessed carefully against a set of published, transparent, criteria, and licences are awarded to the highest-scoring applicants, subject to and in accordance with any foreign policy advice from the UK Foreign & Commonwealth Office. In early 2018 the Government fixed the quota for the 2018 season at 2,170 tonnes and issued 4-year licences to six vessels. Of these six vessels, three are flagged to UK Overseas Territories. The others are flagged to Chile, Uruguay, and New Zealand. A small mixed fishery for Patagonian and Antarctic toothfish (Dissostichus Mawsoni) is conducted in the waters of the South Sandwich Islands. This fishery only takes place in line with scientific monitoring requirements to support the effective conservation and management of regional fish stocks. No fishing is permitted within 3 nautical miles of the South Sandwich Islands, or in depths shallower than 700m. Mackerel icefish (Champsocephalus Gunnari) grow rapidly to a size of 55 cm on a diet that largely consists of krill. They form large aggregations in shelf waters all round South Georgia and Shag Rocks. A pelagic trawl fishery for mackerel icefish operates within South Georgia waters, mostly in the summer months. In 2010, the South Georgia mackerel icefish fishery was certified as sustainable by the MSC, and subsequently re-certified. The 2017 fisheries survey estimates the icefish biomass at South Georgia to be in the region of 90,000 tonnes. Annual catches are currently less than 1,000 tonnes. Antarctic krill (Euphausia Superba) is a key species in the Southern Ocean ecosystem. It is estimated that there are 60 million tonnes of krill in the Southern Ocean. Krill are small (up to 60 mm long) shrimp like creatures that can be found in huge aggregations in Antarctic and South Georgia waters. Krill are important in the pelagic food-web of the Southern Ocean, linking primary production (plankton) to vertebrate predators (fish, seabirds and marine mammals). South Georgia & the South Sandwich Islands is at the northern limit of the krill distribution. Krill at South Georgia & the South Sandwich Islands are not self-sustaining but dependent on the northerly movement of krill in the currents of the Southern Ocean from their spawning grounds under the ice in the Antarctic Peninsula and Weddell Sea. Krill reproduction is highly dependent on sea ice conditions and hence environmental factors. CCAMLR currently restricts krill catches across the Southern Ocean to 620,000 tonnes – a little over 1% of the estimated total krill population. The krill fishery at South Georgia & the South Sandwich is closed in summer during the predator breeding season, with additional pelagic no-take zones (year-round closures) extending 12 nm around South Georgia and each of the South Sandwich Islands. The Government requires 100% international scientific observer coverage in the krill fishery, ahead of the CCAMLR requirement. A major component of the krill fishery is MSC certified. No krill fishing currently takes place around the South Sandwich Islands. 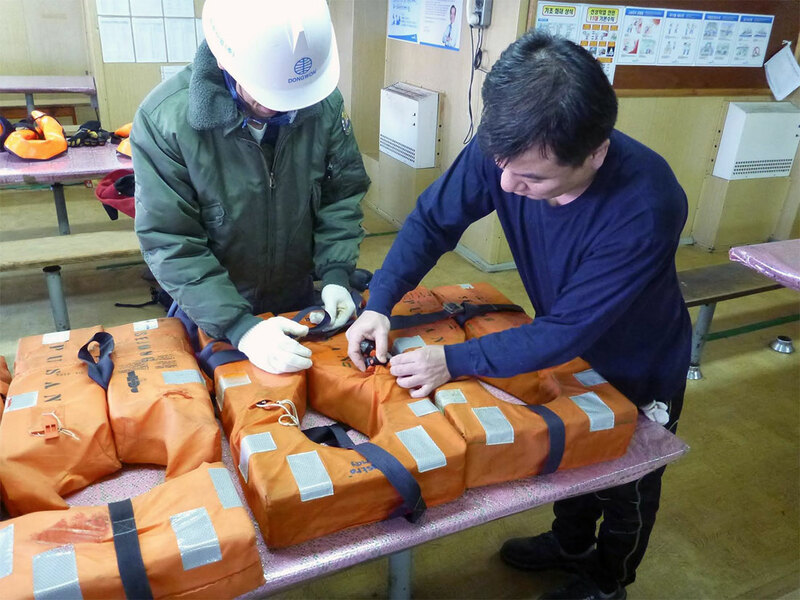 Checking lifejackets aboard a Krill Trawler. 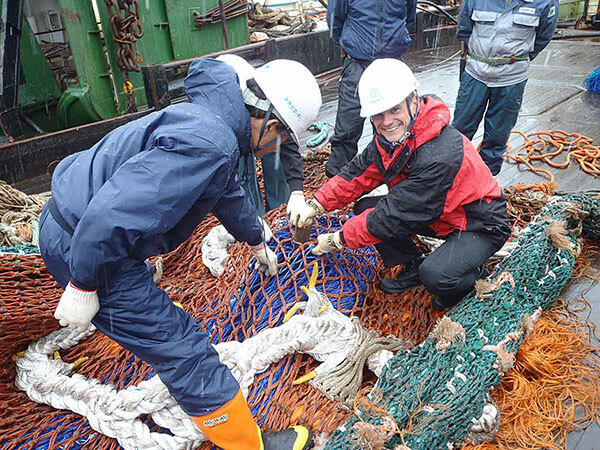 Government Officer inspects a fishing net prior to licensing a trawler. FPV Pharos SG in Cumberland Bay with a tanker, a reefer and a trawler.